It is easy to think of Florida as one big -- and expensive -- golf course. While only the 22nd largest in area, the Sunshine State has the most golf courses of any state in the U.S., and many of these courses are located in the priciest parts of a state long popular with wealthy second-home owners. Chic Palm Beach County has the most, more than any other U.S. county, and quietly ultra-rich Naples has more golf courses than any other Florida city, lined up one after another like strip malls in suburbia, except behind gates and security cameras. In contrast, the Panhandle is a world apart -- topographically, culturally and pricewise. This is especially true in the western half, from Panama City to Pensacola, which includes many excellent golf courses, resorts and golf communities, and represents perhaps Florida's best golf second-home value. It also happens to have what are without a doubt Florida's finest beaches, so soft and white they are locally known as "sugar sand." Grayton Beach State Park has been rated America's Best Beach in Dr. Beach's (aka Professor Stephen Leatherman) annual ranking, and the Panhandle is home to 26 miles of continuous sand certified desirable "Blue Wave Beach," by the Clean Beaches Council. While snowbirds and vacationers from the Northeast religiously flock to South Florida on their beach escapes, residents throughout the south, including Tennessee, Alabama and Mississippi, have been coming here for decades for their beach vacations, mainly because of the excellent sand and surf, one of the best-kept regional secrets in the nation. 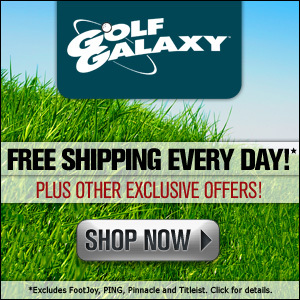 So how about the golf course real estate? South Walton County alone, which encompasses about a third of the western Panhandle, is home to a dozen notable golf courses, most with a residential component attached. These include 14 planned communities, some of which are well known in golf-travel circles. 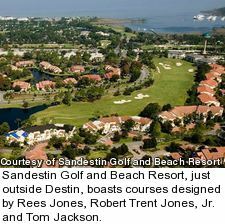 Sandestin Golf and Beach Resort, located just outside the beach town of Destin, is the biggest, a vast community once owned and operated by Intrawest, the development company famed for ski resorts such as Olympic venue Whistler/Blackcomb, Colorado's Copper Mountain and Winter Park, and Quebec's Mt. Tremblant. Intrawest's claim to fame has long been the magnetization of its communities with a large village center full of shops, restaurants and nightlife, all with housing mixed in, usually condo lofts over the shops, and Sandestin is no exception. In fact, the resort is so big and the village so developed that many guests think they have left the property to go into "town" without ever passing through the gates. Sandestin has the best golf collection in the Panhandle, with four courses (Burnt Pine Golf Club, Baytowne Golf Club, The Links Course and Raven Golf Club) by Rees Jones, Robert Trent Jones, Jr. and Tom Jackson. Jones' semi-private Burnt Pine, with endless cart boardwalks winding though well preserved mangrove forests, is the highlight. Sandestin also features 7.5 miles of beach, tennis, a marina, several lakes and much more, with a wide array of bargain condo, townhomes and houses, starting around $120,000 for condos and in the low $200,000s for single family homes. The resort also features an extensive rental program that helps owners generate income when their second homes are not in use, offsetting the cost of ownership. Other top communities here include picture-perfect Seaside, the setting for the utopian town in "The Truman Show," WaterSound and WaterColor. The latter is a 500-acre planned community built from the ground up to recreate the feel of a traditional Southern village, anchored by the WaterColor Inn, just rated the 15th best resort in the nation by Conde Nast Traveler and the region's only AAA 4-Diamond resort. Homesites begin at less than $100,000, and complete, new luxury single family homes start around $500,000. WaterColor shares golf with its sister community WaterSound, home to the acclaimed Tom Fazio-designed Camp Creek Golf Club, along with the Davis Love III designed six-hole Origins Golf Club. 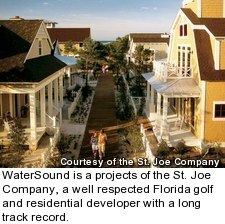 WaterSound has several sub-communities, including the area's priciest, the gated and waterfront WaterSound Beach, where new homes start at about $800,000 but still offer a lot of bang for the buck for Florida, where coastal real estate comes at a huge premium. Owners in both communities also have access to the otherwise private Greg Norman-designed Shark's Tooth Golf Club on the shores of inland Lake Powell. Both developments are projects of the St. Joe Company, a well respected Florida golf and residential developer with a long track record. Smaller communities along this coastal stretch have a wide array of residential options, with condos starting around $100,000. While the Panhandle offers a great combination of golf quality and home value compared to much of Florida, it shares the state's main attractions -- no income tax, fair weather and oceanfront. 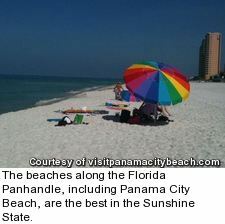 It is also easier to get to than ever with the opening of Northwest Florida Beaches International Airport near Panama City in the summer 2010, served extensively by Southwest and Delta, in addition to the airports of Ft. Walton Beach and Pensacola.